Basically been working fine for a while now, tried to turn on today... all lights up, tho nothing happens, postcode thing hangs on 29 or b2 (pic Below). Tried taking RAM out except one stick one change. Tried with 1 gfx card, tried both of them alone nothing different. 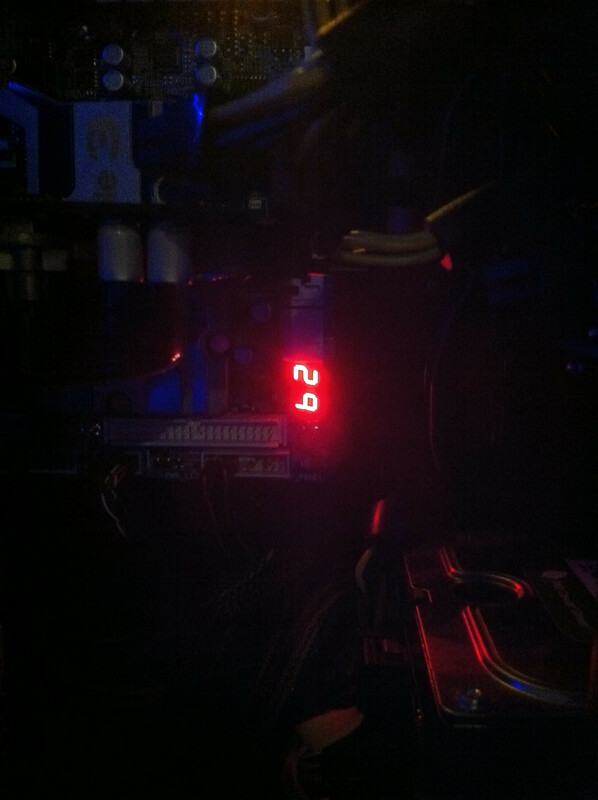 Tried another gfx card from working PC, no change. Tried all different Ram sticks no change. Last edited by xipho; 04-06-2011 at 05:14 PM. the first two don't seem pertinent. . but I don't know what 3 and 4 mean. like lsd said clearing cmos would be a good start. Read CMOS location 14h to find out type of video in use. Detect and Initialize Video Adapter. good call eung ho. if you look at it the other way, the error code could also be read as "b2." B2 is not addressed in the debug code list. Gigabyte GA-X58A-UD7 MB, Intel X58+ICH10R, QPI 6.4GT/s, DDR3 2200, PCI-Ex16, SATA3, USB 3.0, RAID, IDE, 2xGbE LAN, 8ch audio, 2oc PCB, Heatpipe. FF means normal operation, IE board has posted past BIOS and windows has started booting. Can you test with another power supply to rule your current one out as an issue?